The date of Daniel Boone's birth is uncertain, but his uncle wrote in the family Bible that it was July 14, 1732. The family was Quaker, but was excommunicated in 1748 because Boone's father, Squire, had allowed an older son, Israel, to marry a non-Quaker woman. Two years later, the Boone family moved to the Shenandoah Valley of Virginia, before moving on in 1751 to North Carolina. 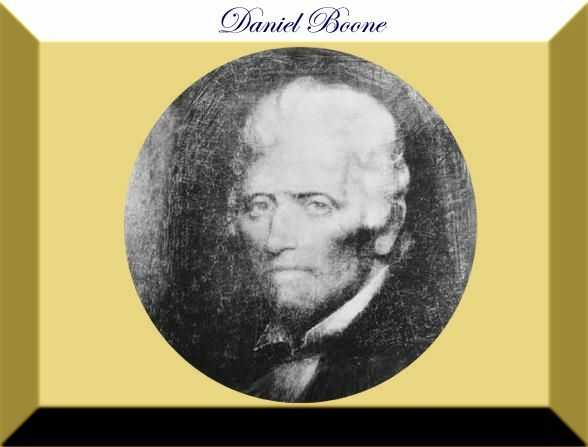 In July of 1755, 23-year-old Daniel Boone undoubtedly became acquainted with a number of Augusta County men as well as future president George Washington when he served as a wagoner in the disastrous "Braddock's Defeat" at Fort Duquesne. He was back there two years later in the Forbes expedition. Boone returned to North Carolina and married Rebecca Bryan on August 14, 1756. The couple had ten children. Daniel Boone loved the Lord. He wrote in 1816: "The religion I have is to love and fear God, believe in Jesus Christ, do all the good to my neighbor, and myself that I can, do as little harm as I can help, and trust on God's mercy for the rest. Click here to Read the Adventures of Daniel Boon by Daniel Boon.